School-wide data network – including fiber connections to outside trailers and a T1 connection to the Internet – implemented at Swift Creek Elementary. Parents donated material and labor to re-cable the campus; PTA donated money for computer labs and classroom computers, Time Warner donated a T1 Internet connection. Swift Creek is an elementary school located in Cary, North Carolina. My daughters attended school there; I was also a member of the technology committee. Thanks to donations from a very strong Swift Creek PTA group, the school enjoyed a state-of-the-art (for 1995) computer lab along with computers in several of the classrooms. While computers in the lab were connected by a local area network, there was no school wide network and no access to the Internet. When the school was built, wiring was pulled from a central closet to all the classrooms. However, the cabling used (Cat 2) was not up to the current acceptable standard (Cat 5). Working with the technology committee and PTA, we created a school technology plan. After reviewing Swift Creek's technology plan, WCPSS allowed us to rewire the entire school with Cat5 cabling using volunteer help. All cabling was tested and certified. We solicited donations to extend PTA and WCPSS funds and were able to buy all of the LAN switches at a major discount. We also ran fiber optic cabling out to the trailers. Time Warner donated a T1 connection to an Internet access provider (TICO). At the time, no other school in Wake County - probably North Carolina - had such a fast Internet connection. The PTA also helped fund at least one computer in nearly every classroom. Now, students in the classrooms, library, and even temporary classroom trailers outside the main building had access to the Internet. 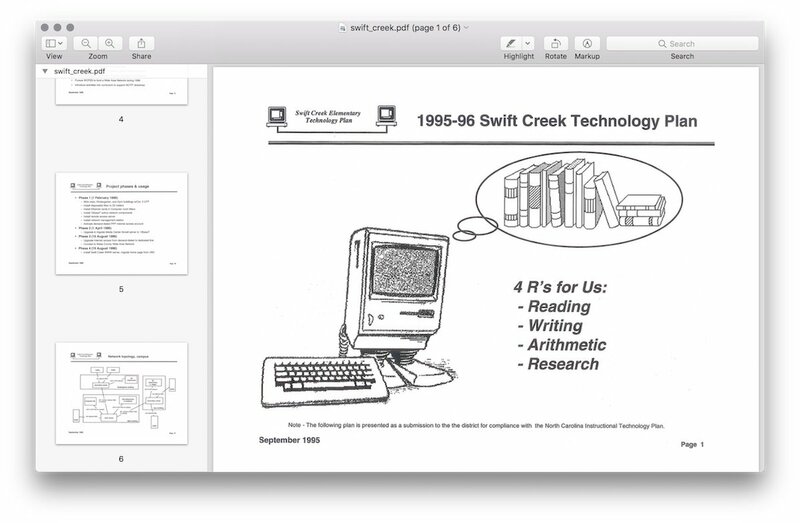 In fact, on May 9, 1997 - Swift Creek Elementary participated in the International NetDay '97 event. Using CU-SeeMe software, students video conferenced with other children in Massachusetts, UK, and Belgium.